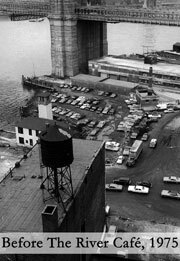 The River Café opened in June of 1977 in a forgotten and abandoned neighborhood by the Brooklyn docks – desolate except for trucks waiting to enter the piers. When Michael Buzzy O’Keeffe first discovered this spot, it was barren and devoid of life. To him, this neglected piece of waterfront was very special – lacking any civility, but with wonderful possibilities. It took twelve years of convincing the City before Mr. O’Keeffe obtained approval in 1974 to begin building the restaurant. 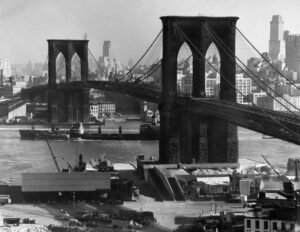 Some of New York’s most important business executives and government officials advised Mr. O’Keeffe that building on the Brooklyn waterfront was extremely dangerous. In 1974, New York City was itself struggling with financial problems, and the idea of creating a serious restaurant in one of NYC’s forgotten industrial districts was beyond crazy. From the restaurant’s first days, Mr. O’Keeffe has insisted that The River Café be dedicated to serving only the highest level of cuisine prepared from the freshest and finest ingredients available anywhere. As a result, the restaurant emerged at the forefront for the arrival of Classic American cuisine on the East Coast, searching out the finest and purest ingredients in every aspect. While The River Café has produced many culinary firsts (e.g. the term “free range chicken” was invented here under Larry Forgione), no other American restaurant has produced as many world class chefs – Larry Forgione, Charlie Palmer, David Burke, Rick Laakkonen and Brad Steelman. The River Café has been celebrated with numerous accolades including: a Michelin Star, The Restaurant Hall of Fame Award, The “Ivy Award of Distinction” from Restaurant and Institutions Magazine, Distinguished Restaurants of North America Award (DiRoNA), The New York Parks Council Award, The Municipal Arts Society Award, The “Wine Spectator Award of Distinction” from Restaurants and Institutions Magazine, The Wine Spectator Award, selected by the French culinary guide, “Gault Millau,” as one of the five best restaurants in New York.